Sonia Chopra, Editor, Eater Atlanta "One that we've started to see already is punch bowls! I think those are going to come back with a vengeance in 2013, along with more communal dining. Shane McIntosh, Owner, Ocean Catering Company "I think people’s appetite for gourmet is continuing to grow and palates are becoming more and more sophisticated, so I believe it will be the year for small-batch foods. Ingredients that have to be nurtured, almost coaxed out to their full flavor potential. I think we will see the coming of more neighborhood butcher shops and high-end specialty stores. Zeb Stevenson, Executive Chef, Proof & Provision & Livingston "I’m still holding out for a revival of classical cuisine. I think many chefs secretly want to indulge their customers with dishes from the Escoffier era but are also nervous about being tagged as 'unoriginal'. But, honestly, who doesn’t love coq au vin? Mike LaSage, Owner, Bone Lick BBQ "We have the trolley going in over on Edgewood, which is going to be great for the Edgewood Corridor. It's really going to change the face of that area for the better. West Midtown is certainly looking promising as well. I also think that the solar flares in May are going to bring some looting for a few days. Also, I saw a bumper sticker that said the rapture is coming. Not sure if that's a new thing or not, but we can have that to look forward to? Oh yeah, and the Falcons are going to win the Super Bowl. And I am going to get a record deal. And zombies will be real. Pass it on. Navarro Carr, Bar Manager, The Sound Table "I think simple concepts will win big in 2013. It's been trending that way, in my opinion, for some time. Places like Antico Pizza Napoletana, winning! Their new 'Gio's Chicken' restaurant concept, my guess... winning! Miso Izakaya's ramen lunch is another prime example. Two types of ramen served for lunch and I would guess they sell out every afternoon. Less is more. Art Smith, Owner, Southern Art "Affordable dining. Comfort is here to stay. Artisan domestic ham is hot. 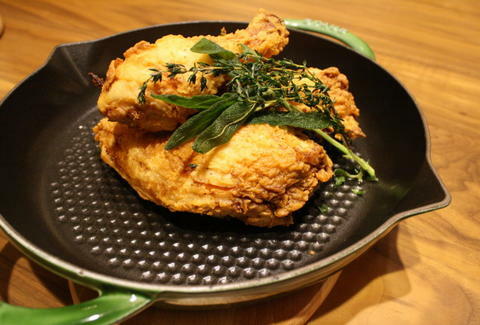 Fried chicken isn't going anywhere. Pub culture, gastropubs will replace fine dining. None corporate -- small artisan chain quick serves. Restaurants offering bread upon request and charging. Paul Calvert, Bar Manager, Victory Sandwich Bar "I'd like to see a greater awareness of Atlanta's larger role as a leader in the Southeast. I want New Orleans, Charleston, Nashville, Louisville, and everybody else to say -- if they're not already -- 'Man, have you seen what's going on in Atlanta?'. A buggy has one driver. Atlanta needs to drive this buggy. Actually, I do have one prediction: I'm going to be working a lot. Adam Evans, Executive Chef, The Optimist "I predict that the Atlanta culinary scene will become a forefront in the world food stage, uniting the South and its amazing chefs and agriculture and putting on the map the greatest region in American cuisine. Brandon Ley, Owner, Joystick Gamebar "Ford Fry & his dream team will open two new restaurants, each more expensive than the last. And then they will swim in their money, Scrooge McDuck-style."